In Shadow of a Doubt, Alfred Hitchcock presents the theme of obsession, which is seen in many of his other films like Strangers on a Train, The Lodger, and Rear Window. Obsession is shown through the unhealthy dynamics of the Newton family, especially seen through the relationship between young Charlie and Uncle Charlie. From the beginning of the film, we see that Uncle Charlie and young Charlie are linked. For instance, they are both introduced into the movie in the same manner: introductory shots of Santa Rosa (where young Charlie lives) and Philadelphia (where Uncle Charlie lives), a camera shot of their bedrooms windows, and a scene of them lying in bed in the middle of the day. It immediately becomes apparent that young Charlie and Uncle Charlie have an inappropriate, almost incestuous, relationship with one another. Young Charlie deems the two of them so close that she mentions how they are more like “twins” than uncle and niece. Mrs. Newton (Emma), who is young Charlie’s mother and Uncle Charlie’s sister, also has an obsession for Uncle Charlie. Emma’s obsession for her brother is so intense that it damages her relationships with her other family members like her husband. For example, Mr. Newton (Joe)’s newspaper, pillow, and chair are taken away from him by Emma to be given to Uncle Charlie. Also Uncle Charlie is seated at the head of the table (where Joe should be sitting) while Joe is forced to sit with the children during dinner. In fact, Uncle Charlie with the help of Emma and Young Charlie, replaces Joe Newton as the head of the family, demoting Joe to the status of a child as shown by him getting gifts at the same time as the young Newton children. 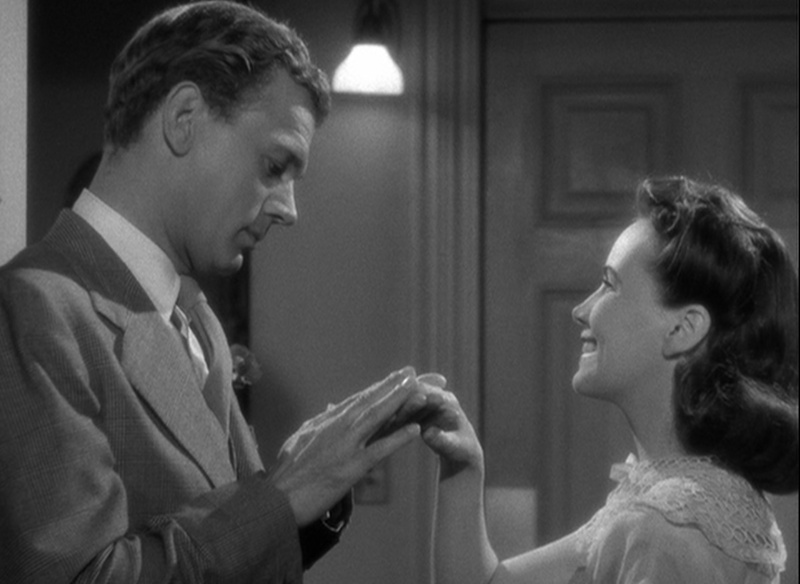 Young Charlie and Emma’s obsession with Uncle Charlie results in them ignoring the oddities of Uncle Charlie’s abrupt arrival to Santa Rosa and Emma remains blissfully unaware of the true nature of her brother, “The Merry Widow Murderer”, throughout the entire film despite the multiple clues Uncle Charlie unconsciously reveals, like his monologue on how disgusting rich widows are. 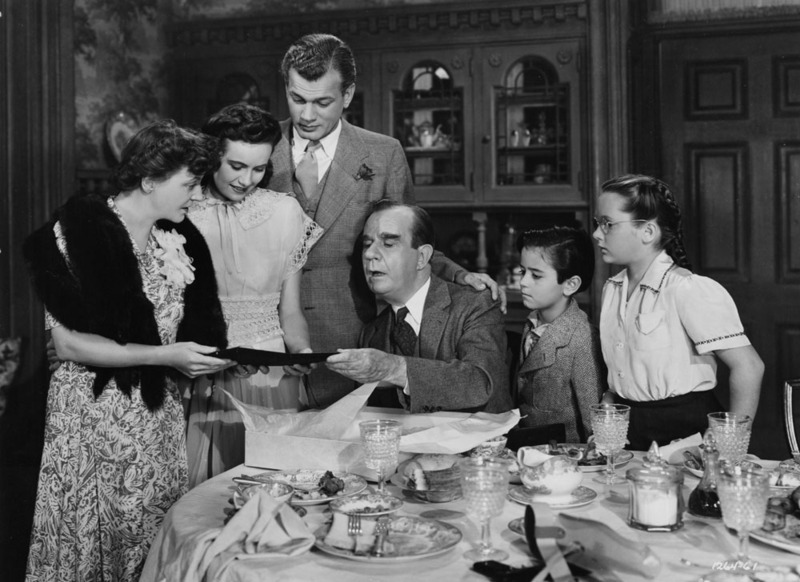 Through the theme of obsession, Hitchcock displays the dis-functional nature of many family relationships to the point where said relationships are destructive. Hitchcock portrays how what may appear perfect on the outside (Uncle Charlie and the Newton family) may actually be more like a cesspool. This entry was posted in Hitchcock Themes on October 24, 2014 by hbvandamm.